Last year, I caught Newbery-fever and followed a lot of the Newbery news leading up to Dead End in Norvelt grabbing the coveted medal. I anticipated the announcement of the winners almost as much as I had looked forward to Christmas. Nerdy? Yes. In line with that, the last three years, I have read the Newbery winners soon after the medal was awarded. But with all my Newbery-nerdiness, one thing has been seriously lacking: I've never read any of the Newbery candidates ahead of time. This year, I decided that was going to change. After all, isn't part of the fun being able to cheer for your favorite (even if your cheering doesn't do a bit of good)? And how can you cheer for a favorite if you haven't become acquainted with any of the potentials? I may not pay attention to politics, but when it comes to books, by golly, I'm going to have an opinion!! So I made a goal that before the awards are announced in January, I would read at least three Newbery nominees. I know, three whole books! If you work hard, you might be able to become an over-achiever like me. Ha! But then, I had to choose which three to start with, and seriously, that was one tough choice since there are some very fine books this year. I could have sat down and analyzed all the titles, but I didn't. I took the easy road. The Newbery medalist in 2010 was When You Reach Me by Rebecca Stead. It was phenomenal, and a book that I still think about to this day. Earlier this year, before I even made my goal of reading three potential Newberys, I saw that Stead had a new book coming out, and I knew I would read it at some point no matter what, so I might as well do it before the end of the year. 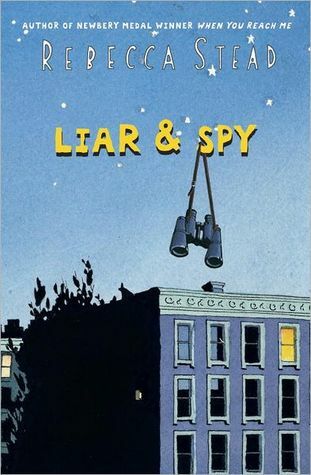 In my pre-reading of reviews, Liar & Spy wasn't getting a lot of glowing attention. Everyone was comparing it to When You Reach Me, and it just wasn't measuring up. I think these reviews actually helped me clear my head and go in with a completely open mind. And because of that, I thoroughly enjoyed this book. A solid four stars for me. When the book begins, Georges (that's not a typo...the "s" is silent) and his family have just moved to an apartment in Brooklyn. Georges' dad lost his job and started his own business, and so they sold their beautiful home and down-sized. While exploring the basement of the apartment building, Georges and his dad see an old and faded sign announcing a meeting of the spy club. As a joke, Georges' dad writes, "What time?" But when Georges goes back down to the basement awhile later, someone has penciled in "1:00?". When Georges returns to the basement at the appointed hour, he meets Safer, a kid his age who never leaves the building and has a bit of a chip on his shoulder. Together they begin tracking the mysterious Mr. X. Through this all, Georges is enduring bullying at school as well as never seeing his mom, a nurse working extra shifts at the hospital. Questions come and go unanswered until finally the pieces all snap perfectly into place. While the ending is not as magical as it was in When You Reach Me, it is just as well executed. Things I thought were real were not and vice versa, but in the end, everything made sense, so much so that I was wondering how I didn't see it coming. I really liked Georges' character: he is kind of a deep thinker. Throughout the book, the reader occasionally gets a glimpse into his thoughts. For example, What if his dad was the same age as him? Would he be friends with his dad? Or would his dad bully him like some of the other boys at school? It seriously made me wonder what it would have been like if my parents had been my peers instead of my parents...would we have gotten along, had the same interests, hung out with the same people? It was little thought-provoking scenarios like that that made me wonder where Rebecca Stead gets her material? At some point in her life, did she wonder if her dad would be a friend or an enemy? Or did she hear another child wondering about it? Or did it come to her in a stroke of genius while she was writing away? But as much as I liked Georges, I might have liked Safer (or Safer's sister, Candy) (or Georges' friend, Bob English Who Draws) even more. It's that kind of book...where the characters are rich and varied and intricate and mysterious. I listened to the audio of this one, but I'm rather impassive about it. Nothing overly remarkable or overly annoying. I don't think it made the book for me, but it didn't destroy it either. Now, because I read this so I could offer a Newbery Opinion, let me offer a Newbery Opinion. I would highly recommend this book to adults and kids alike (and when I say "highly," I really do mean "highly"), but I don't think it will win the medal or even an honor. I don't know if I think this because Stead recently won or because it isn't issue-y or historical or obscure enough, but my gut feeling says no. I wouldn't be disappointed if it won, but I would be surprised. And if you'd like to follow the Newbery-hype along with me (did you even know there was Newbery-hype? ), here are three of my favorite blogs for all the latest news and analysis: Heavy Medal: A Mock Newbery Blog, A Fuse #8 Production, and For Those About to Mock. I need to read this one. As a Wrinkle In Time fanatic, I LOVED When You Reach Me. I've wondered about this one, but I have a lot to finish before I can get to it. Thanks for the review! Oh I definitely like the idea of reading beforehand and cheering your favorite one!